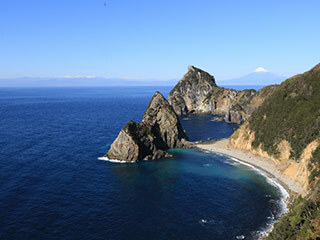 Cape Shiosai is located southwest of Izu Peninsula, Shizuoka Prefecture. It has a great view of Mt. Fuji through, Senkan Gate Rock and Mt. Eboshi. It is one of the best view of Mt. Fuji, especially when the sunset happens, it has a breathtaking view. There is an auto camp site here.